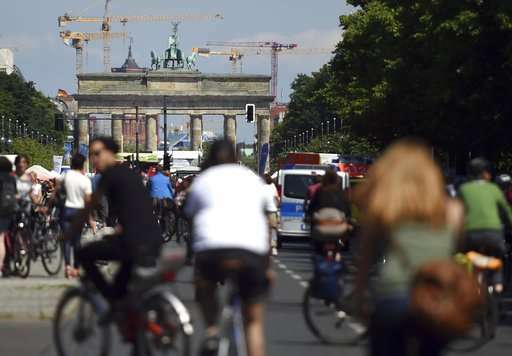 Officials and cycling campaigners in Berlin have agreed to budget about 50 million euros ($53 million) a year to expand bike use with the goal of reducing car traffic in the German capital. Berlin daily B.Z. reported Friday that the money will be used to create protected bike lanes of the kind seen in Chicago and New York, build 100 kilometers (62 miles) of dedicate cycling highways and install 100,000 bike parking spaces. The city was once considered a haven for cyclists but has fallen behind other European and North American cities in recent years. Seventeen cyclists were killed on Berlin's roads in 2016. Separately, authorities approved a test track for autonomous vehicles to drive along the Strasse des 17. Juni boulevard that stretches westward from the iconic Brandenburg Gate. We are seeing an evolution of transportation.